Basra became like many places in the Muslim world a centre for knowledge and commerce. Originally set up on the orders of the Caliph as a military camp, the town had good fortunes but suffered from devastating military attacks including by the Mongols who were at that time allied to the Christians. The name of al-Basra is said to mean the Black Pebbles. It was founded during the reign of Caliph Omar in the year 638. In medieval Europe it had the name of Balsora. It is a city on the Shatt al-Arab; 279 miles to the south east of Baghdad. Basra lay about 12 miles in a direct line from the Tigris estuary, being reached by two great canals, the Ma'kil down from the NE and the Nahr al-Ubullah by which the traffic passed from Basra going SE to the Persian gulf at Abbadan. In the course of history the site of the city has changed somewhat, and we may distinguish between the Old Basra, marked today by the town of Zubayr, and New Basra, founded in the 18th century in the proximity of the ancient al-Ubulla. In 638 CE the companion of the Prophet Utba b. Ghazwan chose the location of the site of Basra on orders from Caliph Omar Ibn al-Khattab (Caliph 634-44) to establish a military camp which was the basis of the city of Al-Basra. In 771 the small traditionally-built village was expanded under Zyad B. Abi Sufyan. In the 8th century al-Basra reached its zenith, as it developed further and its population rose; figures of its population differ between 200,000 and 600,000 during the Middle Ages. Al-Basra was a great metropolis, and a great commercial centre, too. It had a large agricultural economy, was a halting place for the caravans, and its port accommodated ships of large tonnage, and it was powerfully industrialised too, especially thanks to its arsenals. Basra had at all times been famous for its water channels, which according to Ibn Hawqal, in the tenth century, exceeded 100,000 in number, and of these 20,000 were navigable by boats. The Nahr Ma'kil, the main channel in the direction of Baghdad, was built during the reign of Caliph Omar by Ma'kil ibn Yasar, a companion of the Prophet. 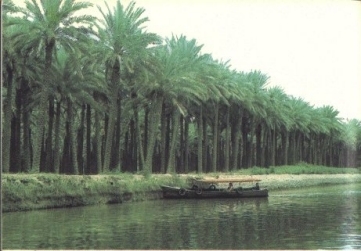 This and the Ubullah Canal, going from Basra towards the south east were each four leagues in length, and the gardens of the Ubullah canal along the south side of the Great Island were held to be one of the four earthly paradises. Al-Basra was, above all, a great intellectual centre. Arabic grammar was born in al-Basra, thanks to the labours of Sibawayh and al-Khalil b. Ahmad in particular. It is in al-Basra that scholars such as Abu Amr b. Al-Ala, and Abu Ubayda, Al-Asmai and Abu'l hasan al-Madani collected historical traditions, and it is in Al-Basra that Arabic prose was born with Ibn al-Mukaffa, Sahl b. Harun and Al-Djahiz. Here we look at some of the scholars of Al-Basra and assess their achievements. Abd al-Malik ibn Quraib al-Asma'i was born at Al-Basra in 739-40; flourished at Baghdad and Basra, and died at Basra c. 831. He was one of the greatest scholars of his time; the rival of Abu Ubaida. He execrated the Shuubite tendencies of the latter and was very pious. He is also one of the Muslim scholars, who, early on, developed the subject of natural sciences and zoology. He wrote many works, chiefly on the horse (Kitab al-khail), on the camel (Kitab al-ibil), on wild animals (Kitab al-wuhush), on the sheep (Kitab al-sha), and also, on the making of man (Kitab khalq al-insan). The latter shows that the Muslims, quite earlier on, already had a considerable knowledge of human anatomy. The books of al-Asmai have benefited from great popularity in Austria in the second half of the nineteenth century. His book of distinction (Kitab al-farq) was edited by D. H. Muller (Vienna, 1876); the book of the wild animals by R. Geyer (Vienna, 1887); the book of the horse by A. Haffner (Vienna, 1895); the book of the sheep by the same editor. Abu Bakr Muhammad ibn al-Hasan ibn Duraid was born at Basra of a Southern Arabian family in 837-38. He flourished at Basra in the early stages of his life. He was a geographer and a genealogist, whose main work was a large Arabic dictionary, `The Collection on the Language,' i.e., the all-embracing lexicon). He also wrote a treatise on the genealogy of the Arab tribes (Kitab al-ishtiqaq, book of etymologies),  partly to counteract anti-Arabian (shu'ubite) propaganda. The Ishtiqaq was edited by F. Wustenfeld. Al-Jahiz (ca. 776-868) was a prose writer of the ninth century whose works rank among the greatest classics of Muslim literature, as well as among the most important sources for the history of medieval Islamic culture. He was born in Basra, then one of the greatest cultural centres of the Islamic world, of a family of slave (possibly Abyssinian) ancestry. He likely spent his childhood in poverty, conditions, which were hardly conducive to academic study, and only al-Jahiz's determination and insatiably inquisitive spirit could have led him to dedicate his life to scholarship. As a boy he had some training in a Qur’an school, but his real education came from attending lectures and discussions at the mosque, and in particular from frequenting the Mirbad, the vast economic and social centre of Basra that teemed with throngs of traders, shopkeepers, sailors, peddlers, and vagabonds of every description. In Basra, then, al-Jahiz was exposed to all kinds of people and ideas, and there he met and studied under some of the greatest scholars of early Islam, among them the philologists Abu 'Ubayda, al-Asmai, and Abu Zayd al-Ansari. He eventually emerged as a master of the Arabic language; and his vivid style, sharp wit, and keen sense of human nature probably owe much to these early days. It is a tribute to the assimilative capacity of Islamic culture, Conrad points out, that al-Jahiz, who was not an Arab and had little contact with the Arab aristocracy in Basra, became such an energetic defender of the Arab community and Arab traditions. Despite the fluctuations in his fortunes, al-Jahiz seems to have been able to live very comfortably and to concentrate on his writing. The resulting literary output was massive—more than 200 works, about a third of which survive either wholly or in part. This vast bulk of material is of utmost importance to the historian of early Islamic culture and society, for al-Jahiz was proficient in a broad range of subjects, topics extending from philosophy and speculative theology to parody and satire, from history and literary criticism to geography, the natural sciences, and human nature. Typical of al-Jahiz's method is his main work, the Kitab al-hayawan (Book of animals), which he began late in life and did not finish. In it he looks at the nature and behaviour of different animals, this work is in fact built on the Qur’anic theme that the world and everything in it is proof of God's existence, wisdom, justice, and mercy. Al-Jahiz's other important works are Al-Baydn wa'l-tabyn (Eloquence and elucidation), a humanistic compendium with particular reference to poetry and rhetoric; political works, dealing with the history of the Caliphate, and problems of succession, some satires, and diverse works on human nature, cultural and intellectual questions etc. His career, Conrad concludes, had an impact of the highest importance on the development of Muslim literature and, indeed, on medieval Islamic literary culture. Al-Jahiz was recognized as the pre-eminent litterateur of his day, and his work inspired and influenced most authors in the generations to follow. His many surviving works are therefore not only important literary pieces but also a corpus of tremendous importance to our knowledge of this critical period in the historical formation of Islamic culture. With al-Jahiz, the best known scholar of al-Basra was Ibn Al-Haytham (965-1039) known under Latin name of Al-Hazen. Ibn al-Haytham's writings on optics have been competently compiled in a study on his tenth centenary. He seems to have written around 92 works of which over 55 have survived. The main topics on which he wrote were optics, astronomy, and mathematics, including geometry and number theory. Anawati outlines in the most succinct of manner the wide spectrum of Ibn al-Haytham's scientific achievements. Ibn al- Haytham, Anawati tells us, discussed the nature of light, declaring that light emanated from the object; he treated the eye as a dioptric system, by applying the geometry of refraction to it. He had some knowledge of reflection and refraction and brilliantly investigated the phenomenon of atmospheric refraction, calculating the height of the atmosphere (ten English miles). He made a study of lenses, experimenting with different mirrors—flat, spherical, parabolic and cylindrical, concave and convex. He also described experiments which he made on starlight, the rainbow and colours, and observed the semi-lunar form of the sun's image cast during eclipses on a wall set opposite a screen with a tiny hole in it: this is the first known instance of the camera obscura. His catoptrics included the problem known by his name: given object and image by reflection in a spherical mirror, to find the reflection point. Ibn al-Haytham's solution of this is wholly geometrical: the algebraic solution was a discovery of Huygens and Sluse in the mid-seventeenth century. It was, indeed, first and foremost, Ibn al-Haytham, who resolved the centuries old issues of vision, and set up the foundations for modern optics. Ibn al-Haytham saw that a correct theory of vision had to combine the `mathematical' approach with the `physical' doctrine favoured by the natural philosophers. Amongst Ibn al-Haytham's major achievements, as already stated, is the camera obscura (Al-bayt al-muzlim), a term first used in Western scientific literature by Kepler (1571-1630). Ibn al-Haytham's treatise contains the first description of the camera obscura. In the third chapter of the first volume of Kitab al-Manazir (The Book of Optics),  Ibn Al-Haytham examines the moon's capacity to emit light without itself being a polished mirror. This led to the discovery that all coloured bodies give off light, and that light and colour are virtually identical. In his experiments to prove these theories he constructed al-bayt al-muzlim which consisted of a darkened room with a small aperture in one wall, through which an inverted image was projected onto the opposite wall. The viewer was inside the room. It worked on the principle that rays of light, reflected from any illuminated object will pass through a tiny hole in a dark room and project the image of the object upside-down on a wall inside the room. It was the prototype of the modern photographic camera. It was a revolutionary invention in the field of optics. This type of device was also used by Ibn Al-Haytham and his students for their astronomical studies on sunspots and other solar and lunar phenomena. Ibn Al-Haytham's treatise had a decisive influence on European physicists. 500 years after Ibn al-Haytham, Geronimo Cardano (1501-1576), who was influenced by Ibn Al-Haytham, suggested replacing the small aperture with a lens. Credit for the introduction of a lens to the camera obscura goes to Giovanni Batista della Porta (1535-1615). Kepler improved it with a negative lens behind the positive lens which enlarged the projected image (the principle used in the modern telephoto lens). Robert Boyle (1627-1691) was the first to construct a small, portable, box-type camera obscura in 1665. Two scientific principles had to be combined to make photography possible- one optical, the other chemical. It was 900 years after Ibn Al-Haytham's invention that photographic plates were first used to permanently capture the image produced by the camera obscura. The first permanent photograph was taken by Joseph Nicephore Niepce in France in 1827. In 1855, Roger Fenton used glass plate negatives to take pictures of the British soldiers during the Crimean War. He developed the plates in his travelling dark room- a converted wagon. In 1888, George Eastman developed a convenient, light sensitive film and introduced the Kodak camera which made possible modern day photography. A version of the camera obscura was used in the First World War for aircraft spotting and performance measurement, and in the Second World War for checking the accuracy of radio navigation devices. The final scholar from Al-Basra is Bakr Ahmad ibn 'Ali ibn al-Taiyib al-Baqilani (d.1013), a Muslim theologian, the most remarkable disciple of al-Ash'ari, whose work he completed. The introduction into the Kalam of the conceptions of atoms and vacuum is ascribed to him by Ibn Khaldun. He extended atomism to time and motion, conceiving them as essentially discontinuous. This is exceedingly interesting, in spite of the fact that al-Baqilani's aim was primarily theological. He wanted to establish the doctrine of God's sole, universal, continuous creative activity. The life and works of Al-Baqilani can be found in greater detail in a number of works, which include Ibn Khallikan's wafayat al-Iyan, Mehren's accounts of the third congress of the Orientalists, and Schreiner's accounts of the eighth such congress. It is difficult to understand why such a great city of Muslim scholarship and economic activity suddenly lost its place. However, after considering its tumultuous history, however briefly, one can understand. The first, very destructive shock, which coincides with the beginning of decline of Basra, took place in 953, when Basra was sacked during seventeen days by the Carmathians. But the city regained its former opulence. In 1052, it was visited by the traveller Nasir Khusraw, who described it as most populous, the city wall being in good repair; however, even then Nasir Khusraw insisted that many quarters of the town were still in ruins not having recovered from the Carmathian destruction. Then, like most of the thriving cities of Islam, the permanent end of the prosperity and high culture of al-Basra came with the Mongols. It escaped the first wave of Mongol invasion of 1219-1222, but not the second, which ended the Caliphate following the combined onslaught of Christian crusaders and Mongols, and their agreement to encircle and destroy the land of Islam. The Pope and the Christian leaders had sent special envoys to the Mongols to agree on a combined allied attack against Islam. Hence, just few years after the Christian envoy returned from his mission to the Mongols, the latter launched their devastating, mostly deadly invasion from which Islamic civilisation was never to fully recover. Whilst the crusaders busied themselves destroying the western side of the Islamic land, the Mongols advanced and destroyed the eastern portion, which culminated in the ending of the Caliphate in Baghdad and the slaughter of one million people there. Basra did not escape either. It was much devastated by the Mongols and Hulagu (1258), especially after the installation of the Ilkhans (the Mongol rulers) there. It became a location of disorder and chaos under their control. When the Moroccan geographer Ibn Battuta saw it in the mid-14th century, it was largely in ruins. -G. Anawati: Science; in The Cambridge History of Islam; in two vols. ; edited by P.M. Holt; A.K.S. Lambton; B. Lewis; vol. 2; Cambridge University Press; 1970; pp. 741-79; p. 755. -Sir Thomas W. Arnold: Muslim Civilisation during the Abbasid Period In The Cambridge Medieval History, Cambridge University Press, Vol. IV: Edited by J. R. Tanner, op cit. ; pp. 274-298. -Baron Carra de Vaux: Les Penseurs de l'Islam; vol. 2; Geuthner; Paris; 1921. -L.I. Conrad: Al-Jahiz; Dictionary of Middle Ages; Charles Scribners Sons; New York; 1980. -Ibn al-Haytham: ed. Hakim Mohammad Said. Hamdard National Foundation, Pakistan; Nov 1969. -Baron Henrion: Histoire generale des missions Catholiques depuis le XIII siecle jusqu'a nos jours (1846). -S.H. Lomgrigg: Al-Basra; Encyclopaedia of Islam; New Series; vol. 1; pp. 1086-7. -M.A.F. Mehren: III Congres des Orientalistes; St Petersbourg; 1876; vol. 2. -Baron G. D'Ohsson: Histoire des Mongols, in four volumes; Les Freres Van Cleef; la Haye and Amsterdam; 1834. -S.B. Omar: Ibn al-Haytham's Optics: Bibliotheca Islamica; Chicago, 1977. -C. Pellat: Al-Basra; Encyclopaedia of Islam; New Edition; Leyden; Brill; vol. 1; pp. 1085-6. -Readers Digest: The Inventions that Changed the World (London, 1982). -William of Rubrouck, envoye de Saint Louis, Voyage dans l'empire Mongol (1253-1255), Payot, Paris, 1985. -A.I. Sabra: The Scientific experience; In The Islamic World; Edited by B. Lewis; London; 1976. -G. Sarton: Introduction to the History of Science; in 3 vols. ; The Carnegie Institution, Washington; 1927 ff. vol. I. -J.J. Saunders: Aspects of the Crusades; University of Canterbury; Canterbury; 1962. -M. Schreiner: VIII Congres des Orientalistes; Stockholm; vol. 2; p. 108; 1889. G. Le Strange: The Lands of the Eastern Caliphate; Cambridge University Press; 1930; p.44. C. Pellat: Al-Basra; Encyclopaedia of Islam; New Edition; Leyden; Brill; vol. 1; pp. 1085-6; p. 1085. C. Pellat: op cit. ; p. 1085. C. Pellat: Al-Basra; p. 1085. C. Pellat: Al-Basra; p. 1086. G. Le Strange: The Lands of the Eastern Caliphate; op cit. ; p.46. G. Le Strange: The Lands; p.46. C. Pellat: Al-Basra; op cit. ; p. 1086. G. Sarton: Introduction to the History of Science; in 3 vols. ; The Carnegie Institution, Washington; 1927 ff. vol I: p. 534. L.I. Conrad: Al-Jahiz; Dictionary of Middle Ages; Charles Scribners Sons; New York; 1980,p. 41. L.I. Conrad: Al-Jahiz; p. 41. L.I. Conrad: Al-Jahiz; p. 42. Ibn al-Haytham: ed. Hakim Mohammad Said. Hamdard National Foundation, Pakistan; Nov 1969. G. Anawati: Science; in The Cambridge History of Islam; in two vols. ; edited by P.M. Holt; A.K.S. Lambton; B. Lewis; vol. 2; Cambridge University Press; 1970; pp. 741-79; p. 755. G. Anawati: Science; p. 755. A.I. Sabra: The Scientific experience; In The Islamic World; Edited by B. Lewis; London; 1976; p. 188. G. Wiet; V. Elisseeff; P. Wolff; and J. Naudu: History of Mankind; Vol 3: The Great medieval Civilisations; Translated from the French; George Allen &Unwin Ltd; UNESCO; 1975; p. 648. Edited by A.I. Sabra; Kuwait; 1983. See the excellent work by S.B. Omar: Ibn al-Haytham's Optics: Bibliotheca Islamica; Chicago, 1977. p.17 fwd for Ibn al-Haytham's experiments on the subject. -Readers Digest: The Inventions that Changed the World (London, 1982); plus Baron Carra de Vaux: Les Penseurs de l'Islam; vol. 2; Geuthner; Paris; 1921; pp. 243 fwd..
 G. Wiet; V. Elisseeff; P. Wolff; and J. Naudu: History of Mankind; op cit. ; p. 648. Readers Digest: The Inventions that Changed the World (London, 1982). G. Sarton: introduction; op cit. ; vol. I, p. 706. Edited by De Slane; vol. 2; 671-2. M.A.F. Mehren: III Congres des Orientalistes; St Petersbourg; 1876; vol. 2; p. 228. M. Schreiner: VIII Congres des Orientalistes; Stockholm; vol. 2; p. 108; 1889. G. Le Strange: The Lands of the Eastern Caliphate; op cit. ; p.45. G. Le Strange: The Lands; p.45. - Baron Henrion: Histoire generale des missions Catholiques depuis le XIII siecle jusqu'a nos jours (1846). Baron G. D'Ohsson: Histoire des Mongols, in four volumes; Les Freres Van Cleef; la Haye and Amsterdam; 1834. Sir Thomas W. Arnold: Muslim Civilisation during the Abbasid Period In The Cambridge Medieval History, Cambridge University Press, Vol. IV: Edited by J. R. Tanner, op cit. ; pp. 274-298. at p.279. S.H. Lomgrigg: Al-Basra; Encyclopaedia of Islam; New Series; vol. 1; pp. 1086-7; at P. 1086. S.H. Lomgrigg: Al-Basra; at P. 1086.